A video has been posted on social media which shows police in an armed standoff with a vehicle. 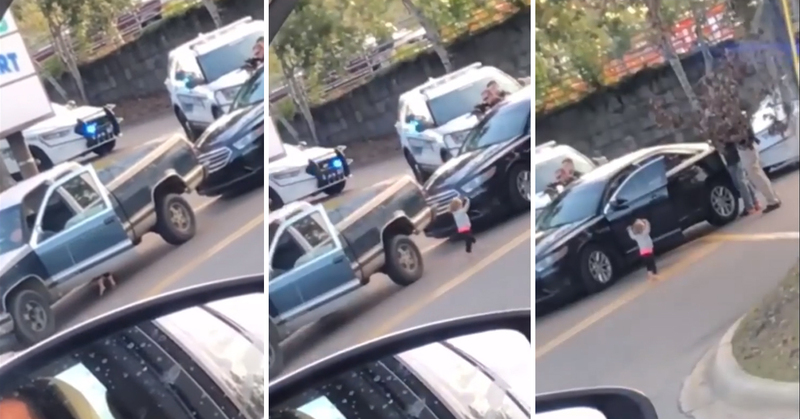 It features a woman leaving the vehicle with her hands raised in the air, then tragically, a little girl doing the same thing while walking towards officers. Tallahassee police were arresting a couple who were suspected of shoplifting when the disturbing footage was captured and posted to Facebook by a concerned bystander. Because the suspects were reported armed, the police were armed with pistols and rifles when the suspects were apprehended. Police allowed a woman, reportedly the mother, to hold her and another child as they dealt with the situation. The incident took place outside a department store in Florida. It was captured on camera by a passing citizen, and viewers were shocked and concerned that, at first, it appeared as though the little girl was among the people that guns were being pointed at. However, the Talahasee Police Department uploaded a video the next day explaining what had happened – it featured the original video, along with a statement from a senior officer, and bodycam footage from police officers at the scene. DeLeo said in the video: “The body camera footage shows the officers’ concern for the children and their compassion as they permitted the mother to care for the children. He also spoke on the value of having body cameras installed on serving officers, and was glad that they were able to document the situation as it really happened. The weapon found in the vehicle was reportedly a pellet gun, and the couple have not as yet been charged with a crime. I’m just glad no one was hurt.